As the oil-rich nation's political crisis continues with two men claiming to be the rightful president amid an economic meltdown, both camps are courting support from the armed forces. 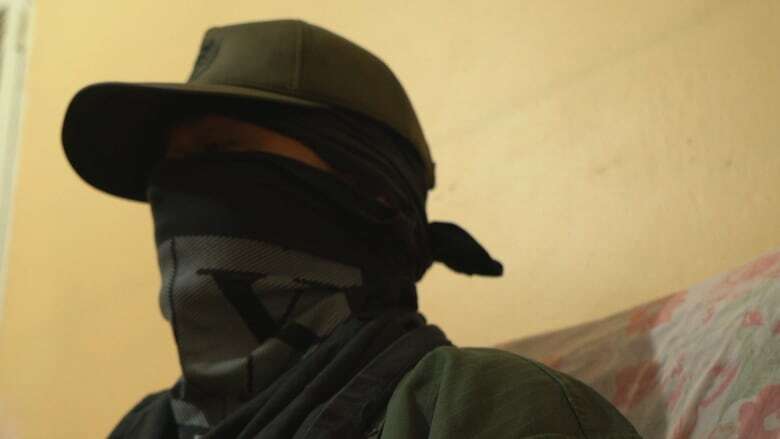 Just after dawn, in a cinder block house on a steep and winding street of a poor Caracas barrio, a self-composed young soldier takes a risk in talking to CBC News. "If they find out I'm doing this, they're going to charge me with treason to the nation, and the consequences for that are torture," he said. The charge also carries a 30-year prison sentence. The man who is being referred to as Pablo is a senior non-commissioned officer in the Venezuelan Army. As the oil-rich nation's political crisis continues with two men claiming to be the rightful president amid an economic meltdown, the allegiances of soldiers like Pablo have become increasingly important. Nicolas Maduro, the man who sits in the presidential palace but is considered an illegitimate leader by the U.S., Canada and most countries in South America, has been showcasing his support from the armed forces in recent weeks. 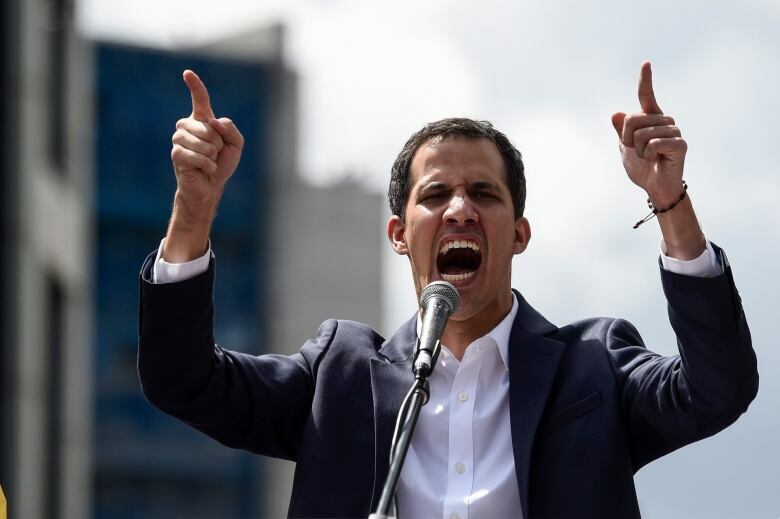 Juan Guaido, the opposition leader who was declared interim president last month by the National Assembly, has been trying to convince members of Venezuela's armed forces to reject Maduro, who the opposition considers a dictator. Guaido was recognized as Venezuela's legitimate interim leader by Western and Latin American nations, while most of the military has backed Maduro. Peeling away that support, from generals through rank-and-file soldiers, is arguably the opposition's most pressing task in their bid to oust Maduro. Venezuela is in the midst of a profound economic crisis involving hyperinflation and shortages of basic food, medicine and other products. The oil industry, the key driver of the South American country's economic gains, is in shambles. "There isn't enough to live," Pablo said. "Many of us have children and we can't take care of them." Two other soldiers arrive while he speaks and sit quietly. All had to report to barracks later that morning. "The scarcity, the insecurity, [affect] us as much as the civilians in the street," Pablo said. Venezuela has one of the highest murder rates in the world. Pablo said he earns about 24,000 bolivars, or about $8 a month at the widely used black market exchange rate. "It's impossible with that to cover the needs of even one person, never mind two or three," he said. "We go through a lot of hunger." One result, he said, is that many soldiers are seeking furloughs to try to help their families. Maduro and his supporters blame Venezuela's problems on an "economic war" launched by business elites, and frequently accuse external actors like the U.S. of trying to sabotage their economy. Maduro, who has recently faced increased economic pressure from the Trump administration, has also accused the U.S. of stoking unrest in a bid to control Venezuela's oil and other natural resources. Pablo speaks of the senior ranks of the forces with bitterness. "They live happily, they live in three-storey houses, they have all the luxuries, they get ahold of all the things you can't get in this country," he said. From private medical clinics, to international travel, he said senior members of the military are doing just fine under Maduro. "We are the majority but we have no-one to represent us as such," he said of lower-ranking soldiers who aren't happy with the current situation. "Nobody can do anything because automatically they accuse you of treason." Once highly respected in Venezuela, Pablo said the military's prestige has been dropping as many opposition supporters blame senior members of the armed forces for keeping Maduro in power. Maduro has said he won a fair election to become president and the opposition is attempting to usurp power by undemocratic means. The European Union, Canada and others have said Venezuela's most recent election last year was not free or fair. Since Guaido swore the oath of office to be declared Venezuela's acting interim president on Jan. 11, the armed forces have been involved in almost daily ceremonies to show their loyalty to Maduro. Soldiers are constantly being called upon to shout the slogan: "Always loyal! Never traitors!" Pablo said he's tired of it. "We're forced to swear that we have devotion to them, we're forced to shout those propaganda slogans they invent." "This government tried to implant a swindle," he continues. "Here in Venezuela, they talked about capitalism versus socialism. They talked about a lot of things but what we got was a dictatorship, just like they have in Cuba." Rocio San Miguel, a Caracas-based lawyer and military analyst, has monitored the Venezuelan armed forces for years as director of the non-profit group Citizen Control. "Of the different branches of the armed forces, the Air Force and Navy are seen as the most problematic by the government. That's historically been true." She describes a military split between the higher ranks, particularly the 24 generals and admirals who hold regional commands, and those from the rank of lieutenant-colonel down. "There is great discontent in the lower ranks of the military, particularly about pay. A major makes just a few dollars a month and it's increasingly difficult for him to earn any money on the side." San Miguel confirmed what some recently retired officers told CBC News: counterintelligence efforts aimed at catching disloyal members of the military are heavily focused on the lieutenant-colonel level. It is no coincidence that former Venezuelan President Hugo Chavez himself held that rank when he staged his first putsch attempt in 1992, part of the country's reoccurring history with military coups. Chavez went on to win the presidency in what were widely considered fair elections. "At lieutenant-colonel level, an officer can have a significant amount of force and firepower under his command," said San Miguel. However, the military has experienced only nine public defections since the arrival of Juan Guaido, and only four of them were in command positions, she said. As part of its security policies, Venezuela's socialist government has brought Cuban troops into the country to support Maduro. There aren't a huge number of Cuban forces in Venezuela, San Miguel said, but the ones who are there mostly focus on military intelligence. "They are also in the strategic operations room of the armed forces and have been since the time of Chavez," she said of the populist leader who died in 2013. The Cubans are concentrated in the DGCIM, a feared military intelligence unit that is leading the hunt for traitors to the United Socialist Party, she said, confirming a point made to CBC News by two recently retired officers. The two retired officers said they are dislike having Cuban forces on Venezuelan soil. Another source of friction has been Nicolas Maduro's decision last month to incorporate the Bolivarian Militia of the socialist party into the armed forces. Career soldiers were unhappy about the move which the government has been trying to make since opposition protests in 2017, San Miguel said. 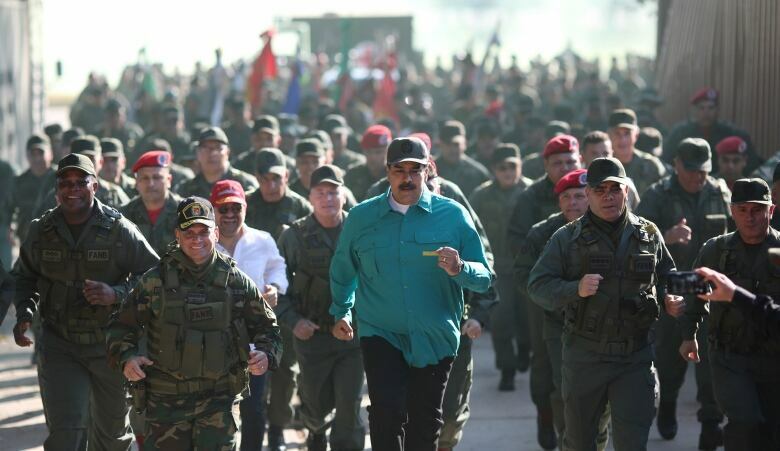 This week's "Angostura 2019" exercises meant to showcase the militia in their new role, have shown instead that they are not ready for combat, she said. Militia members were seen training with Russian surface-to-air missiles to try and give the impression they are a serious fighting force, but they lack basic operational effectiveness, she said. One recently retired military officer told CBC News the militias will be used as "cannon fodder" for the government. The government has said Venezuela mobilized the militias simply to defend the country from a possible attack by U.S. or Colombian forces. Pablo, who believes Guaido to be the country's rightful leader, said he hopes Venezuela's future will be different. More job opportunities. Better security. Ready access to medicine and food rather than having to depend on the CLAP box of the government's monthly ration package delivered to millions of Venezuelan households. As he speaks, Caracas is bracing for another round of large street protests. It's unclear whether the government will react as it did on Jan. 23, shooting and arresting people, or as it did at protests a week later, when it took a hands-off approach. But Pablo is very clear on what he intends to do. "They can charge me with treason against the fatherland, but I'm incapable of opening fire on my own people," he said. "And my comrades? I'd say that the great majority would do the same. I don't think any of them would be capable of gunning down people who can't defend themselves."